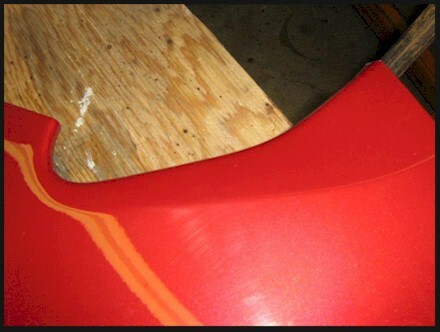 I found this to be a neat trick years ago while painting urethane bumpers. You know the ones, with fake textured black moldings moulded into them. You have to tape the black off then paint the whole bumper, then remove the tape reveling the textured black. I found that all too often I would allow the paint and clear to cure and then I would pull the tape off and have a hard time needing to cut with a razor along the edge or the clear would want to peel off with the tape. I knew that if I pulled the tape off while the clear was still soft or even wet, it wouldn’t peel at all and not only would come off clean with no fighting the clear would even “flow” down over the edge slightly it wouldn’t leave that ugly “curb” like edge where the clear ended at the tape. So, I started reverse masking them. I have actually found that this is a great way to mask and I do it this way whenever I can, even where it isn’t being tape right up on the paint. 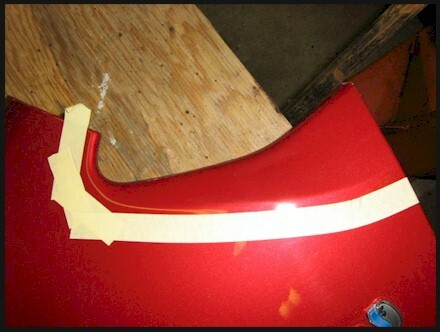 Just masking off a fender, reverse masking works great. It is much easier to unmask this way. Here it is in a nut shell. 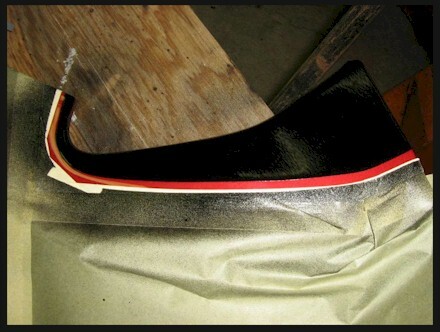 Instead of starting at the edge with the fine line tape like usual, you mask it off away from the edge. In this case I was going to use ¼” fine line tape so I left the masking tape just a little less than a ¼” away from where I want the edge of the black to be. I normally would apply the masking paper or plastic at this point. But in this demo I did it a little out of turn and put the Fine Line first. It really doesn’t matter, but I don’t usually do in this order. I wait until the whole thing is done and tape that critical fine line last to ensure it is fresh and tight when painted. But anyway, in this photo you can see that the fine line is laid. I missed a spot with the regular tape and you can see that a short piece of Fine Line had to be added to cover it. No big deal, happens all the time. You will notice that I left the Fine Line hanging off the edges to grab. I ran the tape around the edge nice with good pressure to stick it but didn’t stick it all the way under leaving it hanging out. 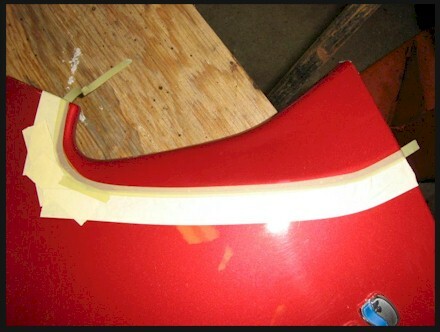 I then covered the fender in paper ONLY putting the tape on the masking tape I started with. NEVER putting the tape over the Fine Line. This is why I always put the masking paper or plastic BEFORE doing the Fine Line. I painted the black and you can see in the next photo me pulling up the Fine Line. This is being done seconds after putting the paint can down (yes this was a rattle can quickie to show the taping procedure) so it was VERY wet. But pulling the tape off away from it, there is little chance of dropping it in the wet paint or something like that. Here it is with the Fine Line peeled off. This is how I would leave it until the paint or clear is fully cured. Only then would the rest of the masking paper and tape come off. Here is the finished product. I kinda looks like edge is a little fuzzy, but it really looked pretty good. Anyway, this was just a quickie to show the reverse tape procedure. 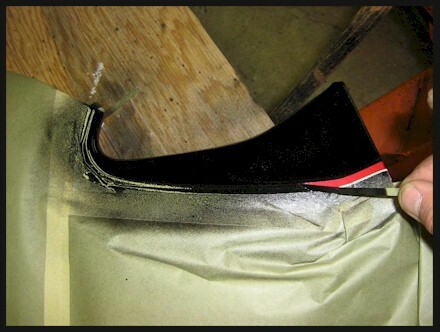 One more thing, there was no sanding what so ever to this OEM Toyota paint before masking or painting. 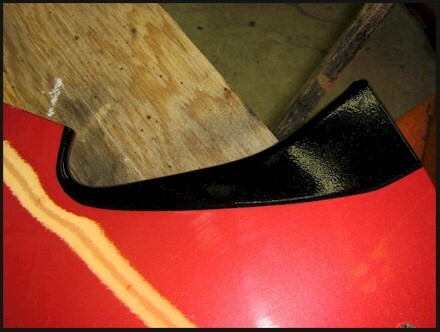 Normally you would use a nice sharp clean scuff pad to rough it up right up to the Fine Line. But in this quickie, I saved the time. But check out how there is no peeling of the paint or anything, because it was still wet when the tape was pulled.